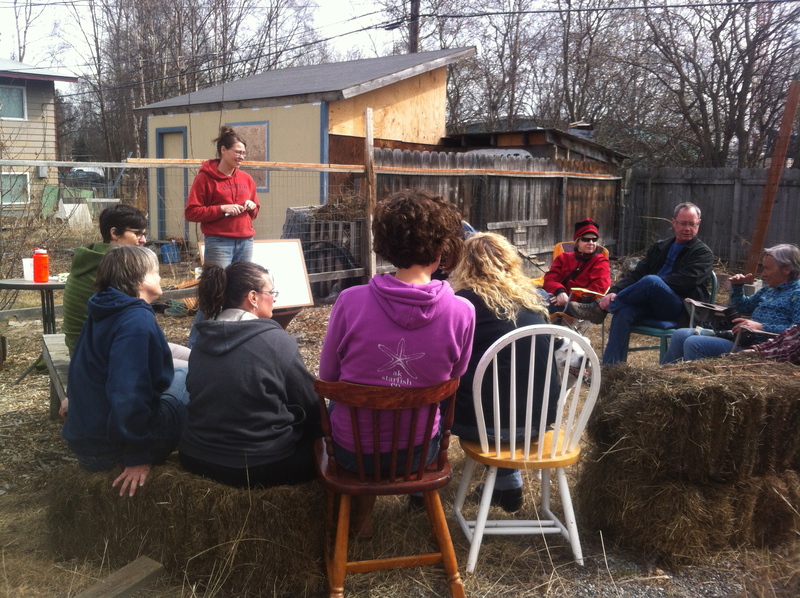 Things are going great at the 30th street community garden! 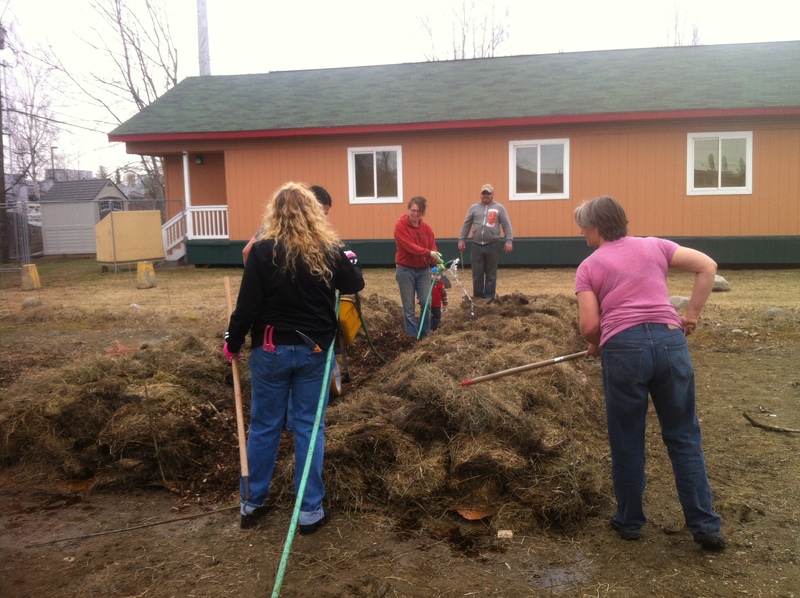 If you remember (and read the previous post if you don’t) I was holding the sheetmulch bed building workshop on May 4. Except that it got really cold and snowed and practically no one came. So I held it on May 11 and everyone came! It was excellent and 2 big 5 x 20 foot beds were built out of maybe 3 cubic yards of pure goat poop (no bedding), a huge amount of cardboard including two rocket box cartopper boxes from REI, and 17 2-string bales of spoiled hay. Two of my tenants divied up one bed, and a neighbor immediately planted potatoes in the other. Sometime later I put together another, slightly less beefy bed (not as thick but just as big in plan view) using cardboard, the entire winter’s worth of chicken bedding (as the ‘green’ or nitrogen-rich layers), old bagged grass clippings from last year, dried leaves, and straw found by my lovely tenant in an Anchorage yard with a sign labeled ‘free browns’ next to the bags. Another neighbor planted flowers and seeds into the thin layer of capping garden soil. 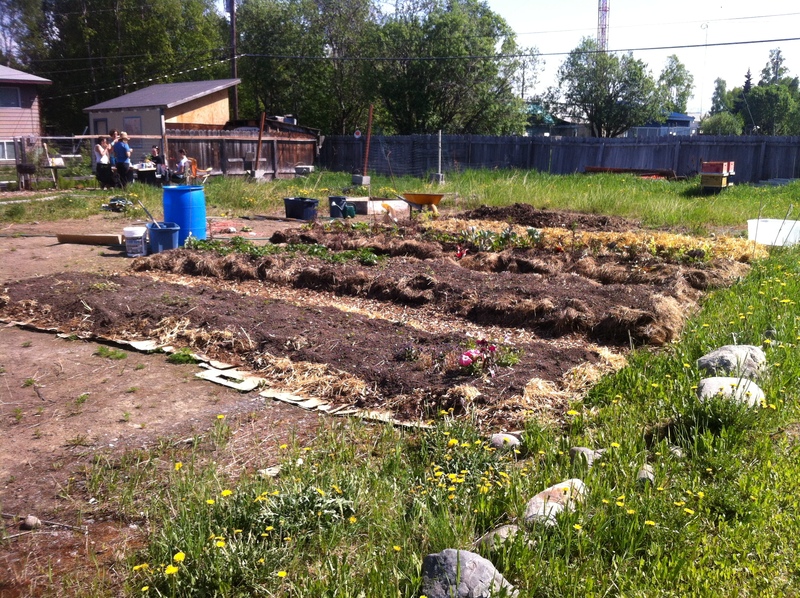 Today, my tenant who works for AYEA (Alaska Youth for Environmental Action) procured more manure from the valley and invited some of the AYEA youth over for a sheet mulch workshop and bed building party, including a bee-keeping demonstration by my beekeeping tenant! It was wonderful! Four 5×20 beds in the community garden! In related news, I am reading Farm City by Novella Carpenter and it is, honestly, a little spooky – all the parallels. Oh, there are the big differences – she rents/squats her space, I own. We only have the occasional shooting on my street, though apparently pretty much the same amounts of crazy (ours and our neighbors), diversity, poverty, drugs, illegal activity. It’s no Oakland here, but Spenard tries its best. My next door neighbor who lives in his car is named Jesus, not Bobby. I live on 30th, not 28th. I have so far only contemplated pigs and rabbits. I ate all of my dog-killed birds, never being sentimental enough to bury any (remind me to tell you about the two delicious ducks that died of cold-related injury this winter and the two delicious hens that were killed by a dog early this spring). So we are totally different. Totally. Really. Except that both of our houses are a total mess. That I will admit is the same.